When it came to sending out baby announcements, we opted to go with 2Peas1Pod. It's a small business set up by a mom/graphic designer, and we were very happy with the results. 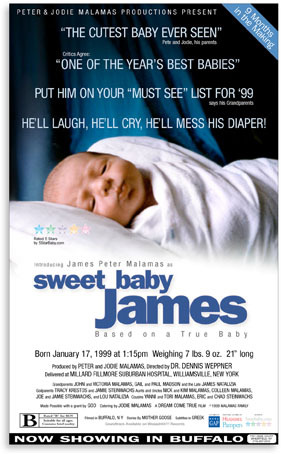 Another designer sent me a link recently to his baby announcement business called 5 Star Baby, where he makes personalized birth announcements that look like movie posters. It's a cute idea, and clever enough without being too "clever" (anyone ever gotten one of these Hershey candy bar "HERESHEIS" announcements?). I can't vouch for it personally, but the business looks similar to 2Peas1Pod, with personalized service and attention, and it's probably something that most of your friends and family haven't seen before. Check them out at 5starbaby.com.